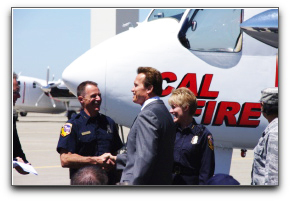 EMS Aviation, a division of EMS Technologies, Inc. (NADAQ: ELMG), announced its flight-following technology shared the spotlight with California Gov. Arnold Schwarzenegger on May 3rd as he watched a real-time demonstration of the state’s new aircraft tracking system technology. EMS Aviation has delivered 20 of 66 Automatic Flight-Following (AFF) systems to California Department of Forestry and Fire Protection (CAL FIRE) and 17 systems are in operation as the state approaches fire season. CAL FIRE plans to equip its fleet of 53 fixed-wing and rotary-wing aircraft with AFF systems by June, according to Chief Del Walters, CAL FIRE director. 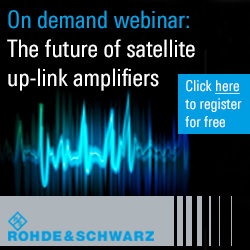 EMS Aviation is a leading provider of Iridium-based voice and tracking systems for aircraft. On average, CAL FIRE responds to 5,000 wildfires a year. Last year the agency responded to 7,000 incidents. When an aircraft is equipped with AFF, dispatchers are regularly updated on its position and flight status, and no pilot action is required for the AFF to function. Reporting intervals are generally every two minutes but may be customized based on operator preference. Flight data is also recorded, and the information collected is instrumental in case of an accident or incident. Aircraft must be equipped with AFF in order to be considered for government contracts in the U.S. and Canada. The EMS Aviation solution is affordable, meets all Forest Service requirements and features flight-proven hardware.